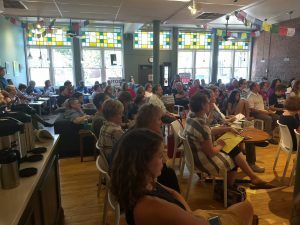 Thursday July 12 at Urban Abbey 90 individuals crammed into Urban Abbey to hear speakers from OLLAS at UNO, Immigrant Legal Center, and Nebraska Appleseed discuss the root causes, laws, and lasting solutions surrounding immigration. Cristián Doña-Reveco from OLLAS at UNO began the presentation with a detailed analysis of immigration in Central America, and reality behind immigration statistics, including that we should not think of the current situation as a crisis; the more we treat it like a crisis, the more drastic measures get taken. To view his presentation click here. 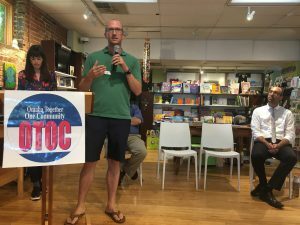 This presentation was followed by the speaker from Immigrant Legal Center, Jeremy Roose who summarized the legal side of issues surrounding refugees and immigrants seeking asylum. For a detailed powerpoint, click here. 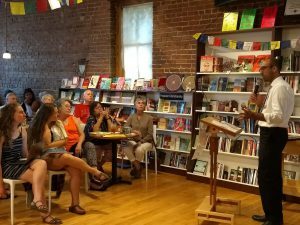 Then, Nebraska Appleseed’s Omaid Zabih focused on what Nebraskans can do in their communities surrounding issues of immigration. He also noted the importance of remaining optimistic about the support that immigrants and refugees have in Nebraska and the importance of individuals raising positive awareness for immigrants. This can begin by talking to people about values, problems, solutions, and actions in their communities. Mr. Zabih also reminded everyone to continue calling their elected officials to advocate for immigrants on policy decisions. To view the Appleseed calling script to use with your elected officials about several different immigration issues, click here. Finally, the presentation concluded with a call to action with OTOC’s Greta Carlson, who spoke about the work OTOC is doing and how people can get involved, see below for action opportunities. To watch the Facebook live video of this issue cafe click here. Conditions in Central America, Mexico, and other countries have sent many families fleeing violence, often to save their lives. As a coalition of diverse congregations and community organizations, OTOC upholds the principles of our founding members concerning immigration. These include the dignity of persons, family reunification, due process, effective border security, and the universal right to seek asylum when faced with violence or persecution. To separate children from their parents is an abhorrent policy. To force parents to choose between either pursuing asylum claims or being reunited with their children is not consistent with these principles…. 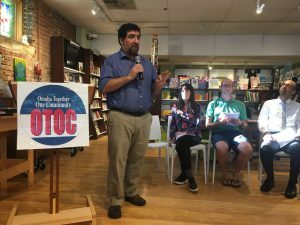 September 17- Candidate Accountability Sessions- OTOC leaders will ask candidates running for congress to commit to working with OTOC on immigration and other issues affecting families. Ongoing- Migrant Education Opportunities– Hear the stories of our newest Omaha neighbors who are impacted by our current migration impasse. For more information: click here. 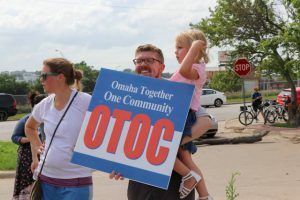 Ongoing- Immigrant Accompaniment– The Omaha Area Sanctuary Network accompanies immigrants to their immigration hearings in Omaha. Having support from the community lets the judge know that the person is a part of the community. To learn more accompaniment, email Jeri Thurber at jeri.thurber@gmail.com. The sanctuary network also sponsors immigrant families who are coming to the immigration court. To assist with that, email Larry Jensen at lpjensen@abbnebraska.com.